The World Chess Federation or FIDE election season is in full swing as both candidates have had to face accusatory inquiries stemming from past contracts apparently exhibiting a “conflict of interest”. ChessBase.com ran a story titled, “Contractgate” detailing a six-page contract drawn up by Attorney Morton Sand and one that Garry Kasparov and Ignatius Leong has apparently agreed to. The contract was verified as authentic by Sand. Kasparov, a former World Champion, announced his candidacy last year. 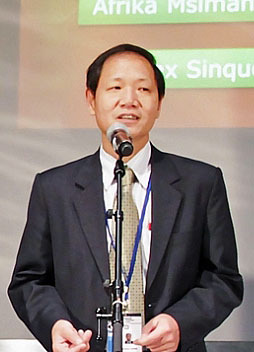 A major twist is that Leong serves as General Secretary of FIDE under current President Kirsan Ilyumzhinov, Kasparov’s opponent. However, Leong is currently on Kasparov’s ticket! The controversy stems from the an agreement in which Leong would be provided with a grant to (1) fund Kasparov Chess Foundation in Asia for four years and (2) set up a new Secretariat in Singapore from which to execute FIDE’s chess commissions. The agreement signed by Leong and Michael Khodarkovsky (Executive Director of KCF) detailing specifically that the grant was to be spent “only for the Project”. It goes on to state that the grant would not be used to influence legislation or elections, implying the FIDE election. Happier Days? 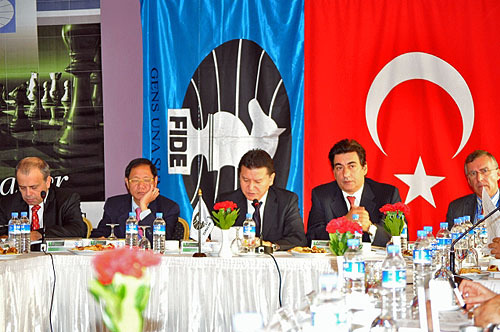 2010 FIDE President’s Meeting: (L-R) Ali Nihat Yacizi, Ignatius Leong, Kirsan Ilyumzhinov, Georgios Makropulos, Nigel Freeman. Both of these contracts were clarified by Attorney Sand and Kasparov released a statement and gave a full disclosure including copies of two contracts which contains initials of both on each page (Kasparov-Leong… Leong-KCF). One point of contention is the contract seems to imply that Kasparov was gaining written proxies from Asian federations for financial support. 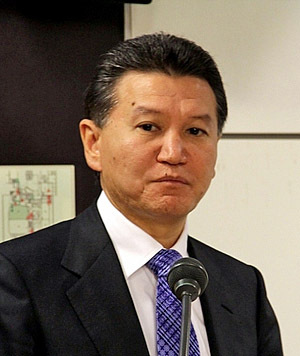 Kirsan Ilyumzhinov attacks and defends. Meanwhile FIDE turned up the heat and cited a “conflict of interest”. Ilyumzhinov accused Leong of accepting a “gift” for the Asian bloc vote and called for his resignation. Leong refused and responded that he was accountable to the FIDE General Assembly. Ilyumzhinov reiterated his request (letters here). Kasparov then responded to this claim stating that the contract detailed the agreement and that no monies were to be given directly to an individual, but only for the development of chess through the KCF (Kasparov’s reply). The next week the London Times broke a story about Kirsan Ilyumzhinov and Andrew Paulson having a questionable contract. The arrangement would have made Ilyumzhinov a stakeholder in AGON, a chess company owned by Paulson and a chance to profit from events in which it organizes. This would include the World Championship franchise. There was a very public debate that involved GM Nigel Short who apparently received a document from “a former AGON employee” that sources stated was GM Robert Fontaine. The story that broke in Sunday London Times has raised the stakes in what has become an increasing heated contest for FIDE President. Nevertheless, these accusations were published on various websites including ChessBase.com and ChessVibes.com. Paulson went on the offensive and first stated that the document was stolen and then manipulated for political purposes. GM Kevin Spraggett got involved after the contract was posted on his website and was warned by Paulsen. In this exchange, Paulson informed that Ilyumzhinov was not an stakeholder in AGON and produced a legal document to the effect. I am the sole owner of AGON and the sole shareholder. I am currently in the process of selling the company, as I am running for Deputy President of the European Chess Union and owning AGON would constitute a conflict of interest. It appears that both parties are trying to increase the momentum as the new year has begun and federations are gearing up for the Olympiad. Questions have been raised concerning Kasparov’s suggestion that funding of KCF-Asia would be contingent on a certain number of votes delivered and the AGON has been queried on whether there were other signed beneficiaries including Ilyumzhinov. For now both sides have responded to the attacks, but the questioning will continue. Kasparov2014.com, Press Release: Kasparov-Leong Agreement, 25 September 2013. Kasparov2014.com, KCF-KCFAP Agreement, 31 October 2013. Kasparov2014.com, Statement by Morten Sand, 20 January 2014. 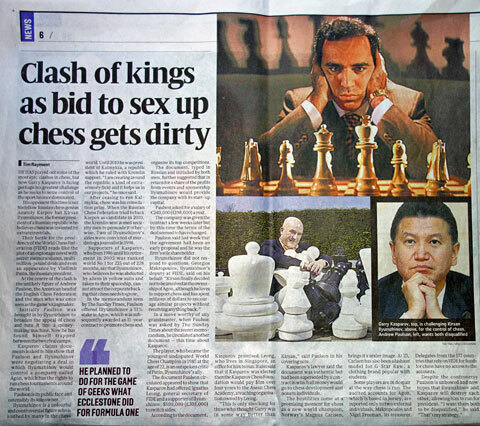 Dylan Loeb McClain (nytimes.com), “Kasparov’s Moves in Run for Chess Office Raise Ethical Concerns,” New York Times, 21 January 2014. Dylan Loeb McClain (nytimes.com), “Intrigue, Conspiracy, Alien Abduction: Politics of Chess Go Off the Board,” New York Times, 9 February 2014. Another row has surfaced in relation to the FIDE Presidential campaign. The English Chess Federation has released minutes from the 81st meeting of the English Chess Federation Board. The emergency meeting was to discuss actions of Andrew Paulson and Nigel Short during the recent media controversies. President Andrew Paulson tenure has reached a bump in the road. Weeks ago there was the “Contractgate” controversy after being accused of giving Kirsan Ilyumzhinov 51% share in his own chess promotion company. In turn, Paulson accused Nigel Short, ECF’s delegate to FIDE, of aiding and abetting Kasparov’s campaign quest to discredit both he and Ilyumzhinov… and perhaps benefiting financially from doing so. Paulson even called the actions emanating from this board meeting a “coup d’etat”. The muckracking has spilled out into the media for a few days now and the row threatens to divide the federation.